This community service event honors our Maryland heroes laid to rest in the Maryland (Crownsville0 Veterans’ Cemetery in Millersville. 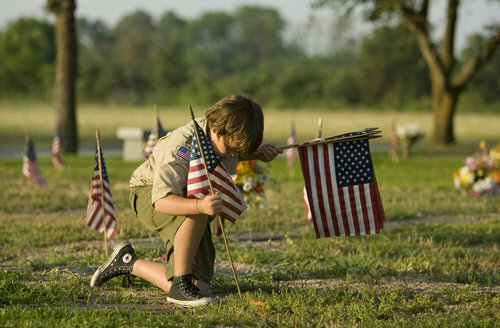 On the Saturday morning of Memorial Day Weekend, Scouts place more than 15, 000 American flags on Veteran's graves at the cemetery. Units should bring drinking water and devices for making small holes (a long screwdriver works well.) There’s a part for everyone, and Scouts of all ages can participate. This is a solemn and moving tribute, offering Scouts a greater appreciation for sacrifice to the nation and insight into our national and state history. For more information, please contact Chris Barth.